Tornadoes, floods, hurricanes, earthquakes, blizzards, landslides, forest fires, heatwaves, hailstorms, avalanches, volcanoes, tsunamis, sinkholes, and other natural disasters put millions of Americans at risk. The actual risk varies considerably with where you are in the country. If you live in Minneapolis and St. Paul, what is the risk of natural disasters? Tornadoes have struck Minnesota, and have caused many fatalities, and billions of dollars in property damage. Minnesota is at the northern end of "Tornado Alley" and tornadoes are not as frequent or as devastating here than in states like Oklahoma. But, they should not be taken lightly: brutal tornadoes have struck Minnesota and claimed many lives. In Minneapolis, a tornado struck North Minneapolis in 2011 causing extensive property damage and the loss of two lives. And in 2009, an F0 tornado caused serious property damage to South Minneapolis. Tornadoes have struck the city of St. Paul on many occasions, including a particularly severe storm in 1904 which killed 14 people. Parts of Minnesota has experienced severe flooding, but the Twin Cities are relatively safe from flood waters. 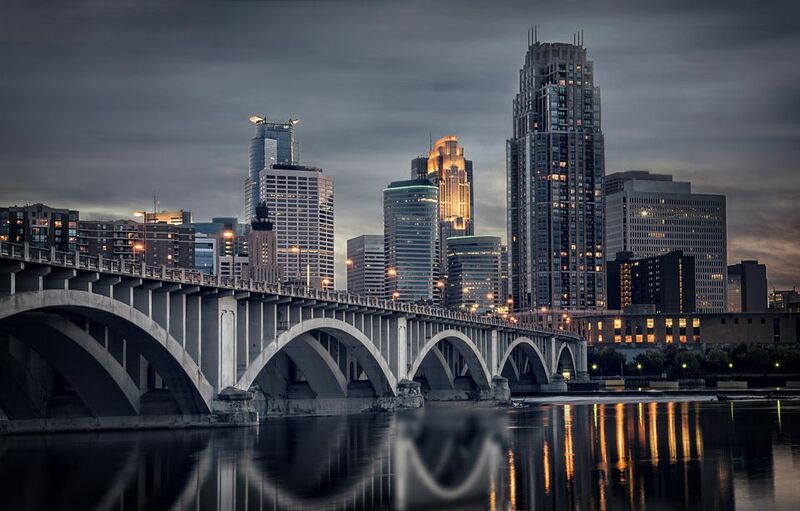 The Mississippi River runs through a gorge in much of the urban area and generally would need to rise to unprecedented levels to threaten Minneapolis and St. Paul. (North Minneapolis and downtown Minneapolis, and the lowest-lying parts of downtown St. Paul would be most at risk from the Mississippi.) The river is closely monitored so keep an eye on the local news. Local flooding from other stream and rivers is possible, in the spring runoff and after heavy rains. The winter brings blizzards to Minnesota. some of the risks from a blizzard are dangerous driving conditions, and power outages. Most fatalities from blizzards happen on the roads: one of the worst thing you can do in a blizzard is drive. Avoid the roads, and have a car emergency kit in case you are caught in a blizzard. The Twin Cities don't experience the snowdrifts that southern Minnesota and the Dakotas do, so you are unlikely to get stuck in your car for a week in the Twin Cities - but avoid driving anyway. Summer storms often bring hail, and golf ball sized hail has been known in Minneapolis and St. Paul. Property damage is the main risk, with the risk of damage to cars, roofs, animals who can't take shelter, and other property. Injuries and fatalities from hail are possible but unlikely (high winds and flooding are more dangerous) but if you have dogs or other animals who are kept outside, ensure they have somewhere to take shelter in the event of hail. Minnesota's summers bring strong storms, with high winds, hail, lightning, and the possibility of tornadoes. High winds and hail can fell trees and power lines, damaging cars and houses, and posing a risk to life. If storms and/or lightning is in the area, seek shelter inside a sturdy structure. A hard-topped vehicle provides protection against lightning strikes, but very little against falling trees or tornado-force winds. Here are some Lightning safety tips from the Minnesota Department of Public Safety. Minnesota's summers are hot and humid. We don't experience temperatures over 100F very often, but the temperature often hits the 90s, which is quite capable of causing serious health risks. Minnesota's summers raise the possibility of heatstroke, which is a medical emergency and can be fatal for the young, old, and those who do physical activity in the sun and heat. Recognize the symptoms of heatstroke, never leave dogs or children in a car, and check on vulnerable neighbors during the heat. For landslides to occur, there needs to be land to slide down, often hills or steep slopes and Minneapolis is predominantly flat. The exceptions are bluffs above the Mississippi River and nearby areas in Minneapolis and St. Paul. (Local building codes require buildings to be set back a certain distance from the edge of a bluff). Landslides are known in these areas, often after heavy rains. A recent tragic landslide claimed the lives of two young boys at Lilydale Park in St. Paul in May 2013. Avoiding bluffs, steep slopes, and landslide areas, particularly after heavy rain, would seem prudent. Greater Minnesota does experience forest fires, with fires occurring annually, mostly in the wooded northern parts of the state. Forest fires cause property damage, loss of habitat, and loss of life. While there is a present risk to many areas, including the suburbs of the Twin Cities, the risk to the urban area of Minneapolis and St. Paul is very small. According to the Department of Natural resources, 98% of forest fires in Minnesota are started by human activity. If you are camping, follow burning restrictions, which often go into place in the summer, and always make sure that your campfire or cooking fire, and matches and cigarettes, are out cold before you leave. Sinkholes can form in areas where there are caves, streams, mines, tunnels, or other open spaces below the ground. The earth or rock over the open space can give way without warning, resulting in a sinkhole, and a bad day for whatever was above the sinkhole. Southeastern Minnesota and parts of Wisconsin have a type of geology known as a karst landscape, where many caves and natural tunnels have formed beneath the ground. The town of Fountain, in the southeast of the state, claims to be the "sinkhole capital of the world". The Twin Cities themselves stand on slightly different land, and sinkholes are less likely here than in the southeast of the state. However, in the Twin Cities, underground tunnels to run utilities, divert streams, and build subterranean structures, are very common and have been dug for over 100 years. Forgotten or badly maintained man-made underground excavations have been known to collapse, so while the risk is small, it is possible. Minnesota has plenty of snow. So, avalanches are possible? Actually, avalanches are very unlikely to affect us. Avalanches require steep slopes that snow can build up on, and then fall. We don't have any mountains near Minneapolis and St. Paul, and very little steep terrain for snow to build up on. Avoid digging or activity at the bottom of steep slopes with thick snow cover. Unlike tornadoes, hurricanes and tropical cyclones form over the oceans. Minneapolis and St. Paul are so far from the oceans that hurricanes are unlikely to affect us. Turbulent weather resulting from far-away tropical storms washes over Minneapolis, but overall the risk is minor. Another form of severe weather system - tornadoes - are another matter - see above. Minnesota has experienced a few minor earthquakes over the years, but Minnesota is located far from major fault lines and is at low risk for major earthquakes. The largest earthquake recorded in Minnesota was in 1975, measured magnitude 5.0, was centered in the area of Morris, and caused minor damage to some structures and no fatalities. There's more earthquake information at the USGS Minnesota Earthquake Page. Minneapolis and St. Paul are too far from major bodies of water to worry about tsunamis. Flooding is more likely to damage property and pose a threat to live - see above. Minnesota is located far from volcanically active areas and has not experienced any volcanic activity for about a billion years. USGS Page on volcanic activity in Minnesota.